Why Google is not Indexing my Site?! Are you facing the same Problem? Having you website indexed by Google is one of the most important parts of SEO. Your site must be indexed by Google if you want to get massive organic traffic from Google. If your site is not indexed, you are lost. You will get no organic traffic from Google and no one will see your site in the Google Search Results. If you're facing the problem that Google is not indexing your site, so in this article we're sharing some possible reasons due to which Google is not indexing your site. Having Duplicate content is a major problem which prevents Google to index your website/blog. 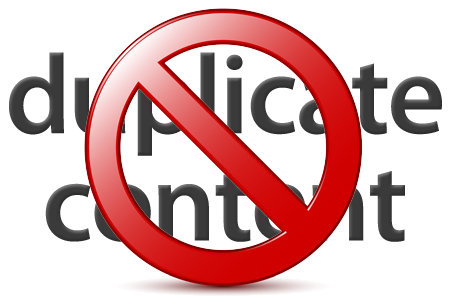 To much duplicate content on your site confuses the search engines and they give up on indexing your site. If multiple pages/URL's on your website are returning to the exact same content, then your website has a duplicate content issue and that's the reason Google is not indexing your site. If your website is indexed under a www or non-www Domain, then Google may not index your site because technically www is a sub-domain. So, be sure that you add both with www and without www domain to GWT and verify ownership of both domains. If your website is new, then Google may not have discovered it yet. Wait for a few days and for better indexing Sign Up for Google Webmaster Tools and submit your sitemap. 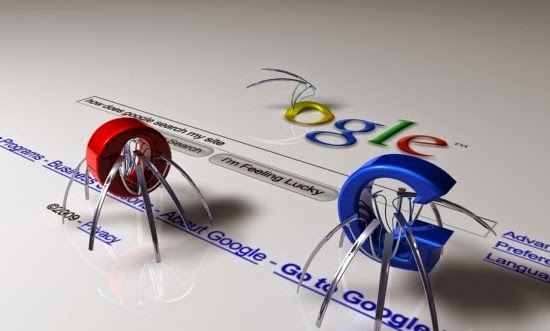 This helps Google crawl and index pages that it might not discover through normal crawling process. This file is in the root of your website and it communicates with search engines to index your site or not. If this file contains User-agent: * Disallow: / it means that its saying to crawlers that not to index any page of your site. The fix is easy, just remove that text from that text file and your site will be indexed. You haven't submitted your sitemap to GWT. If you haven't submitted your sitemap to Google Webmaster Tools or your Sitemap is not updating for some reason and you just have some old/broken links in GWT then you might face indexing problem. Read our article How to Submit your Sitemap to Google Webmaster Tools on to learn How to Submit Sitemap. If you've submitted your sitemap and you're still facing the problem then resubmit your sitemap. If your website takes too much time to load then Google might not index your pages. Because in this case spiders will skip your site as they can't reach it, so they'll not index your site. If your website has downtimes, for this reason spiders cannot reach your server when they try to crawl, they fail, due to downtime. So check your connectivity and the fix is to contact your hosting provider or buy a new one. There are also some other reasons that cause your site not indexed by Google. So if you're facing Google Index problem, then read and fix the above reasons and keep searching for more till your site gets indexed. What do you think that you'll publish a post on your blog and the comments and shares will start rolling in? No, you're wrong. Increasing website traffic has always been a major problem for Bloggers. Writing quality content is not enough. You've to spread the word all over the world. Without readers, a website is nothing. No matter how good and informative post you've published on your blog, if it isn't seen by readers. And the only way to get our posts read by people is to promote it everywhere you can. Recently, we shared some articles on increasing your website traffic and we got good response from our readers, so today again, we're going to share some proven strategies for increasing your website traffic. Here's An Ultimate Guide to Increase your Website Traffic in 2015. The Social Media Usage is increasing every year. Social media usage has increased in 2014, as compared to 2013 . People are using social media for both business and personal usage. Let's take an example of Facebook there are billions of active users on Facebook. So, if you share your website posts on Facebook, I think it would be great for you. Uh! I know what you're thinking now, that How is it possible to reach all those billions of people? It's impossible, I know. But there are hundreds of Facebook group having millions of members. So, just join those groups and share your posts on daily basis. You can get those groups by using Google. But remember, social media isn’t all about posting content, it’s more about engagement. So, do post your content, Post Questions, Ask opinions, Do surveys and take the full benefit of social media. Many of us have the mentality of sharing once and done. But that's not the right way. You publish a post, and share it just once, so what about those people who missed your post? Some people log in to their account daily, some people after 1-2 days, while some people on a weekly basis. So what about those people? That's why you should post more than once a day. You Published a Post Today! Share it --> Share it again after 2 days >> Share it again after a week and then share the same post after a Month. But remember, don't get crazy about sharing. Yes, that's right! Don't behave like lazy people by sharing 15-20 times a day. The best way is to share 3-5 times a day and keep your followers busy. Enough said! Share the same post more than once with different Unique and Catchy headlines. Share it with a quote, its title or write an interesting headline. Here's another killer tip to boost your traffic. Engaging with other bloggers is a great way to boost your traffic. 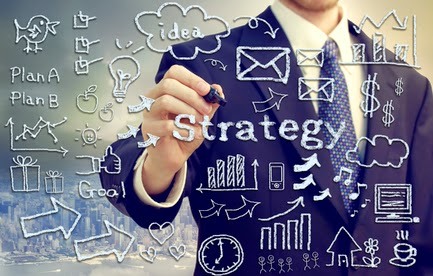 Its a proven strategy and it helped me a lot in increasing my website traffic. Lets take an example, you're a designer and imagine what would happen if hundreds of designers meet at one place? Obviously they will share their ideas and bla bla bla. Same in the case of blogging, if you join a blogging community, you'll meet other bloggers and all of you share your posts. In this way they'll visit your blog and its impossible that you wouldn't find some interesting posts written by other blogger. In this way, you can boost your traffic and engage with other bloggers. And thankfully, you don't need to spend a dime to figure out where a large portion of your audience can be found on the web. So participate in communities related yo your niche, engage with other bloggers and increase your website traffic. What is Guest Posting? Simply, guest posting is to write an article and submit it to a website that accept guest posts. If your post gets accepted, they'll publish your article on their website and in return you'll a backlink to your blog. Simple. Right! Guest posting is one of the best ways for increasing your website traffic. Guest posting doesn't only help you in increasing your website traffic, it also sends you external links from those sites, and the more links your site gets, the better it will appear in search engine results. There are thousands of ways for increasing your website traffic. We just shared some important and effective ways in this post. A part of all above methods, focus on your content, write quality content and don't forget SEO. What you think about the above methods? Let us know in the comments. Facebook is the #1 social media network with 1.19 billion monthly active users and 728 million daily users. Facebook helps you connect with people and your friends and family for free. For bloggers Facebook is one of the major sources of traffic for their websites. Bloggers are generating thousands to millions of visitors from Facebook. Would you like to drive more website traffic from your Facebook page? 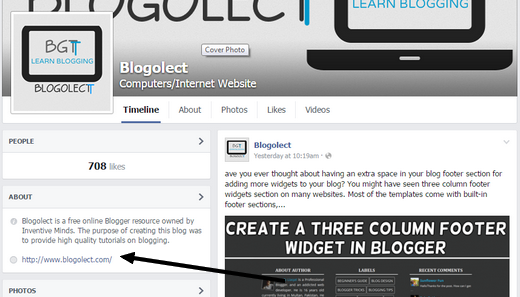 Facebook provides incredible opportunities for driving traffic to your blog/website. With its billions of active users, you can generate massive traffic to your website from Facebook. Combining your website with Facebook can generate millions of visitors for your website. With a Facebook page you can reach thousands to millions of users for your website. Today in this article, we're going to share 8 effective and creative ways to boost your website traffic using Facebook. The first thing you should do after starting your website is to Create a Facebook Fan Page for your Website. After creating a page for it., promote your page by sharing it on your Facebook Profile, inviting your friends to like it and request them to share on their profiles. You can drive massive traffic from your Facebook page, if you're doing it the right way. A Group can also be very helpful for generating traffic to your blog. For example, you created a Facebook Group for your website and it has +10 thousand members. If just 2000 members are active, so imagine how much traffic your blog will generate from that group. So, create a group add your friends to it and request your friends to add their friends to it. By using your Facebook Page and Group in the right way, you can generate massive traffic from Facebook. Don't forget to Join our Page and Group on Facebook. No doubt, a Fan Page is nothing without the fans. After creating your fan page, don't forget to promote it. Invite all of your friends to like it and request them to promote your page. Share your page with other bloggers and make your page go viral. 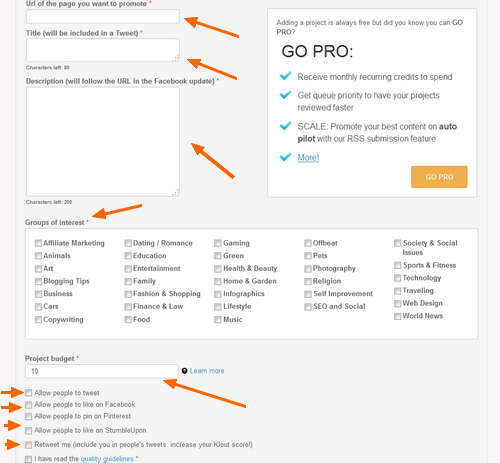 After creating your page and group, don't forget to join other groups related to your niche. Join the groups related to your niche and having thousands of members. After publishing articles on your blog, page and group, share it on all the groups you've joined. It really helps in generating traffic. Another easy way to drive more traffic to your blog is by adding your blog URL to the about section of your Page and Group. People will visit your blog as soon as they read the description. But remember in order to display your Blog URL in your about box, write a description of just one or two line and then leave your Blog Link. If your Description is too long, then people will have to click about section. So write a short description and then leave your link. This group is created by WEBSITE URL. There is no need to keep the post link in the text of your posts. When you add a link to your posts, Facebook generates its click-able preview with your post link and on click it redirects to your link. So, there is no need to keep the URL in your post text. Removing the link gives your posts a unique look. The best way is to add the Post Title or a Short Description about that article to your post text. Share a link to your blog on your page regularly. It keeps your followers updated to your latest posts. It's not important to share a single link every day, you can share multiple links, but remember share your links after some time interval. Like sharing a link after 4 or 6 hours, by doing this people will receive your posts on their Newsfeed more than once a day and by sharing after interval they would have some time for reading your recent post. Also, if you don't publish content on your website, keep sharing the previous interesting posts in order to keep your fans busy. It's a great way for generating massive traffic. No doubt that blog posts are too long and contains thousands of words. While sharing your posts on Facebook, keep in mind that don't copy-paste your complete article or 7-8 lines of your article. Just keep it simple and short. Share your Posts with a 2-3 lines of text. About what your article is? Just take some 2-3 interesting lines, a quote about your post or its title and share it. It gives your post a clean and unique look. People will get interested by reading those lines/quote. 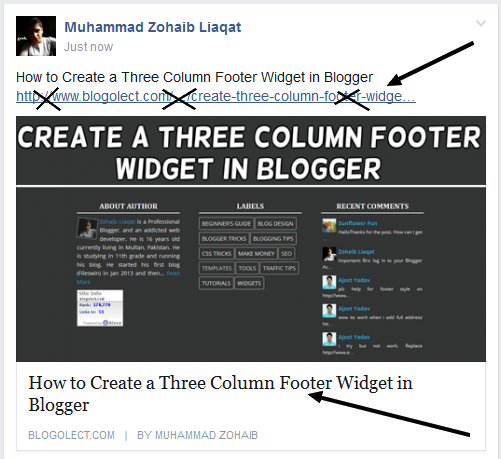 Create a List of the Most Visited or Commented articles and share it on your page. It generates more clicks to your Website from Facebook because your followers get a complete list of your last week updates. A weekly wrap-up post gives your fans a chance to see your last week's articles at a glance. You can also publish a post on your blog every month with the most visited posts of the month. Advertise your blog and posts on Facebook and give a boost to your reach. You can advertise on Facebook as low as $5. Facebook advertising is a great way to boost your website traffic if you've money. You can use Facebook ads for advertising your website, page, posts and for increasing conversations on your website. You can generate thousands of visitors to your website/blog from Facebook, if you use it in a right way. 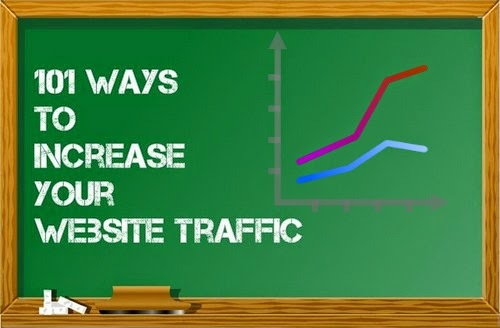 We hope all the above tips would help you in generating free massive traffic to your website. What do you do for generating traffic to your website from Facebook? Share your tips in the comments section below and subscribe us via email to receive more interesting articles directly to your inbox. Generating traffic has always been the problem of every blogger. People use their own different techniques for increasing their blog traffic, like Advertisements, Social Media etc. A part of all these techniques there are also some secret techniques that most of the people don't know. Today we're going to share one of those secret techniques, and that is ViralContentBuzz. Most of the people think its just a waste of time but believe me! It Works. I've been using viralcontentbuzz for last 4-5 months and truly it helped me a lot in increasing my social media authority and my blog traffic. 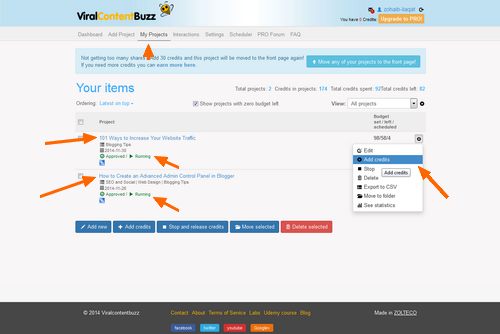 So, in this article we'll discuss about Viral Content Buzz and How to Use it for Generating Massive Traffic. First of all, lets talk about what is Viral Content Buzz? 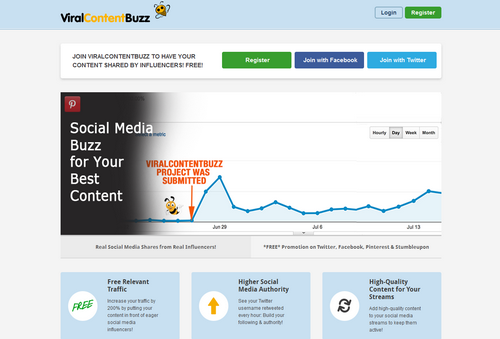 What is Viral Content Buzz? Viral Content Buzz is a service owned by Gerald Weber and Ann Smarty. Its concept is just brilliant. Viral Content buzz is a platform that utilizes a crowd-sourcing model to facilitate the generation of REAL “social buzz” on quality content. For example, you write an outstanding post and publish it on your Blog. The next thing is to promote it, okay, you shared it on your Facebook page, twitter account and G+ Profile, but the post still runs out of steam. Here comes the concept of ViralContentBuzz. 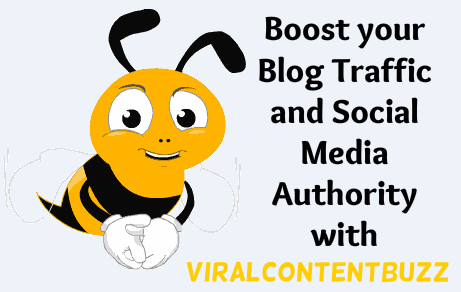 Using Viral Content Buzz you can generate hundreds of shares to your content. Lets see How it Works? It's just simple, Promote others Content and get your Content Promoted. The more you promote others content, the more credits you earn and the more shares you generate. Promote others content, you'll earn credits, add those credits to your Content and Generate Social Shares. VCB supports Facebook, Twitter, Google+, Pinterest and StumbleUpon. Joining VCB is free, you don't have to pay a penny. How to Use it for Increasing your Shares and Traffic? First of all, go to Viralcontentbuzz.com. Register a new account or join by Facebook or Twitter. After the Registration, confirm your account and Log in to your Account. It'll redirect you to your Dashboard. Now its time to add your project, click Add Project, enter your Project Details and click Submit. Note: It doesn't allow Direct Link/Home Page URL to your Blog. You can only submit your Blog Posts. The moderators will review your project and approve it. Once your project gets approved, now share others content to earn credits and add them to your project. To earn credits again go to the Dashboard and share others content on your profiles. Upon sharing it'll ask you to add your social profiles, so add your social profiles and start sharing. After earning credits, go to My Projects, add those credits to your Projects and start generate shares to your content. Thats it! 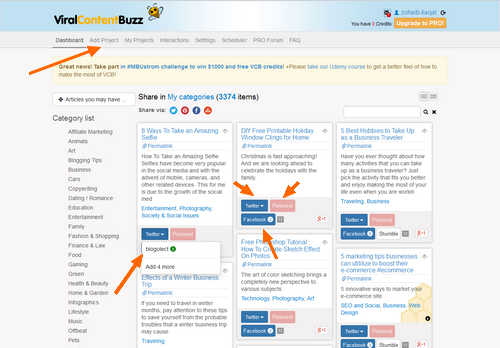 Now, use viralcontentbuzz and start generating Massive Traffic to your Blog. We hope this article may help you in generating more traffic to your blog and increasing your social media authority. Share this article with your friends and don't forget to subscribe us! Creating a blog is easy, but creating a successful blog is hard. What makes a blog successful? Obviously Traffic! But the problem is how to increase your website traffic. Lack of website traffic is one of the most common problems of bloggers. Traffic is the only thing where it all starts. No traffic means Nothing. There is no huge secret in increasing your website traffic. It all comes to passion, patience, hardwork, quality content and most important, the 101 Ways that we're going to share today. So, if you just created a blog or you're struggling to increase your traffic then this article is going to be a great resource for you. There are thousand of ways that you can use for generating traffic. In this article, I am going to share 101 ways for increasing your website traffic. I hope you find it useful. 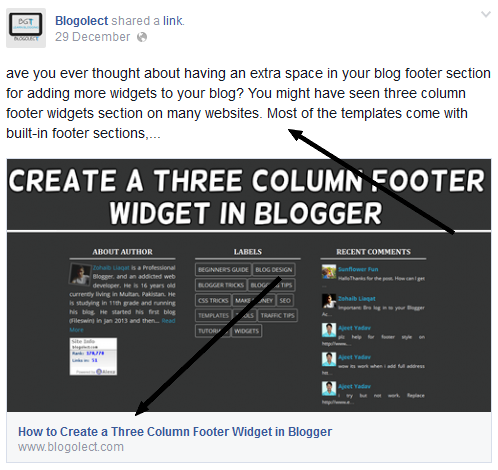 67- Add widgets like Popular Posts, Most Commented Posts etc. There are thousands of methods for increasing your Blog traffic. We just shared some of them. Remember, If you want to achieve something then you've to do hardwork. Same is the case with blogging, to make your blog successful, do hardwork, be passionate and determined, write killer content, share it everywhere you can, focus on your blog SEO and don't give up. If you’ve got your own tips for increasing traffic, I’d love to hear them. What’s your favorite technique for increasing traffic? Let us know in the comments section below. With the passage of time, the blogosphere is getting bigger and better. Thousands of blogs are created daily with millions of competitors. People are still finding it difficult to promote their blog to increase their traffic, people use their own different techniques to promote their blog. Some of them use Blogging Communities, Commenting while some of them use Social Media. 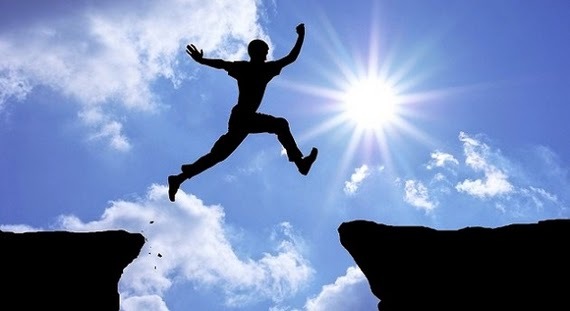 But the truth is that none of these methods could take your blog to the chasm. One of the best ways to promote your blog is to start a free contest or giveaway, through this service we can offer free gifts to our readers by doing some simple jobs like sharing our blog on social media, commenting on our blog and etc. These contests makes our readers to revisit our blog again and again. Today in this article, we are going to share some top Sites to create and run giveaways easily and for free. Gleam provides beautiful and stylish generators for your blog. 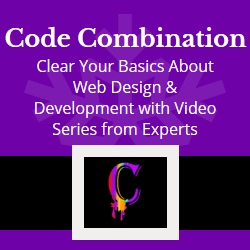 Its easy to use and no coding is requires. All it takes is just 5 Minutes and your generator is ready. Embed the code and see it working live on your blog. Rafflecopter is just like gleam and easy to use. All you've to do is Create your Generator >> Embed the Code and you're done. PromoSimple provides both free and premium entry forms. You can easily customize your forms and no coding or skills are required for creating a generator. 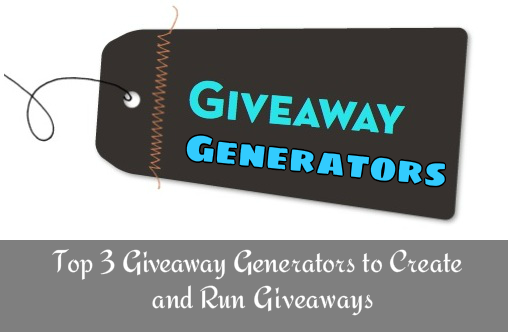 We hope this tutorial may have helped you in creating a Giveaway Generator for your blog. Share this article with your friends, share your opinions in the comments below and don't forget to subscribe us. Still not getting enough traffic to your blog? Traffic, yes Traffic is the main problem of every blogger. Getting traffic to your blog isn't easy and its even more difficult if your blog is new. There are various successful ways to promote a blog. You can read my previous article on 7 Ways to Increase your Blog Traffic. There are hundreds of ways for promoting a blog. You can get traffic by Guest Blogging, Commenting or by using Social Media, but none of them could last for a long period. 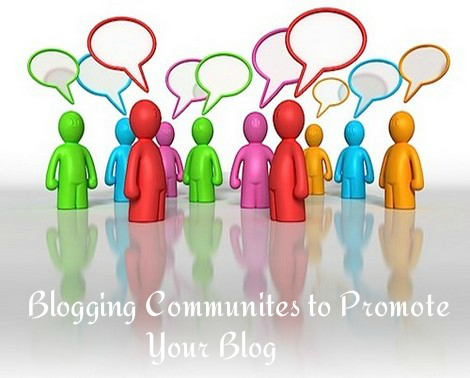 One of the ideal ways to promote your blog is by joining Blogging Communities. Basically Blogging Communities are like Social Networks for Bloggers or we can say that Blogging Community is a place where bloggers across the world interact with each other, engage and drive a good amount of traffic to our blogs, they share each other's posts and build relationship. Blogging communities helps us to drive more traffic to your blog, we can learn about new topics for our blog posts and we can meet new bloggers. Whatever joining blogging communities is a great way for promoting your blog. So, today in this article we are going to share some top Blogging Communities to promote your Blog. BlogEngage is the most popular blogging community with its huge number of members and growing day-by-day. If you really want to interact with top bloggers then blogengage is the best. Here people submit their posts and drive massive traffic to their blog. Blogengage is a premium blogging community that you've to pay £19.99 for a standard account but you can also get a free standard account. To get a free account visit get a free blogengage account. Klinkk is another great new blogging community founded by Erik Emmanuel to drive traffic to your blog. Its free and all you've to do is submit your posts, get voted and get great traffic. Inbound is another great community with thousands of active users. You need to get more votes to make your post to the first page. So, join this community now, join the discussions, increase your votes, take it to the first page and drive traffic to your blog. Blokube is another blogging community to share your blog posts and to promote your blog. Register an account, interact with other bloggers and promote your blog. BizSugar is one of the oldest blogging communities and it is used widely by bloggers across the world. Sharing your posts on bizsugar is a great way to promote your blog. Triberr is a great place to engage traffic to your blog. Submit your articles, interact with other top bloggers and share your thoughts with them. There are several ways to promote your blog and drive more traffic, but no doublt that joining blogging communities is one of the easiest ways for promoting your blog. So, join these blogging communities and engage your blog's traffic. At last, share this article with your friends and don't forget to subscribe us. Got a Question, then let us know in the comments sections below. Started a New Blog? Don't know how to drive more traffic to your blog? Don't worry, today in this article we are going to share some top ways to increase your blog traffic. Traffic is one of the most important parameters of your blog, the more traffic you have, the more people you have to read your ideas and articles. If you want a strong readership for your blog, its obvious that you need to create great content. But that's not sufficient, not only great content is required for a successful blog. Create great content, share it on social networks, that's not all that is required to build a thriving blog. To build a thriving blog, you also need to learn that how to drive traffic to it. There are almost unlimited number of ways to increase traffic to your blog, here are 7 top ways to get you started. We know that people visit our blog to get knowledge or to learn something new. If you've published quality content on your blog, then people will your blog regularly as they know you're providing great content to them.If your content is helpful for them, them they'll visit your blog daily as they know that you'll publish something new in which they're interested. Which means that about 70% of your blog's traffic depends on your content. As Content is the King, so if your blog contains quality content then there is no doubt that people will not visit your daily, again and again. Guest Blogging is another great way to drive more traffic to your blog. Write Guest posts on other top blogs, if your post gets accepted, they will publish your post and in return you'll get a back link to your blog, top blogs have thousands of daily visitors, which means thousands of people will read your article and in return you'll get great traffic from that post. So write quality guest posts and increase your blog traffic. How to Submit your Blog/Website/URL to Google, Bing and Yahoo! Submit your blog posts on social media websites like Facebook and Twitter is a great way to boost your traffic. Create a Page on Facebook >> Promote it >> Submit your Posts on your Page and you'll see a great increase in your blog Traffic. So, use social media and boost your traffic. The first thing that people notice when they visit your blog is your blog design. So, if you want people to stay on your blog then you should give your blog an eye catching look, once they're interested in your design then they will read that what you've published on your blog. To make your blog attractive you should give then a clean design which includes Beautiful Header >> Easy Navigation and User Friendly. Another great way to boost your blog traffic is to submit your content to best bookmarking websites like stumbleupon, Reddit, Digg and more. So, submit your blog posts to these bookmarking websites and boost up your traffic. Images don't just make your blog pretty but also increase your traffic and search engine listing. People often use Image options provided by search engines like Google and Yahoo. So, adding images to your blog with search engine optimization can easily boost your traffic. There are hundreds of other useful methods to increase your blog traffic, we just have shared just 7 of them and we'll try to share all of them. 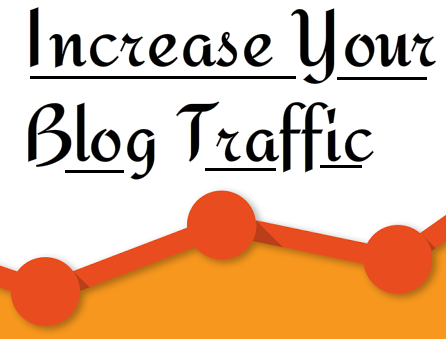 We hope that this article will help you to increase your blog's traffic. Share this article with your friends and don't forget to subscribe us. Want To Get Hot Updates? Follow Us On Your Favourite Social Networking Site To Start Getting Notified!